The custom part of my art quilt business has been exceptionally busy, leaving little time for creative art quilts exploring new designs. In January, between customs, I took advantage of a free week to create two new designs. First, I created a new version of “Birch Trees by the Lake”, 23″H x 28″W. You’ve heard it from me before….I get bored creating very similar quilts over again. I like to try new layouts, new backgrounds, different ways to blend fabrics and colors. I studied more photographs to see how colors of lake water and sky blues blend and ebb and flow from light to dark. I tried to create some of those colors in this new quilt. 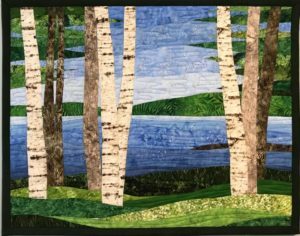 I used my only birch tree-like fabric for the trees in the foreground but used darker and shaded fabrics for trees in the background to create a greater sense of depth and perspective. This is a spring/summer season so lots of greens!! All different shades and designs of fabrics. Finally, I left the mountains on the other side of the lake out and did just some dynamic greens as if the lake wasn’t so large and there were trees on the other side. It is still abstract in many qualities but I’m very happy with the end result. several paintings which I pinned on Pinterest years ago! 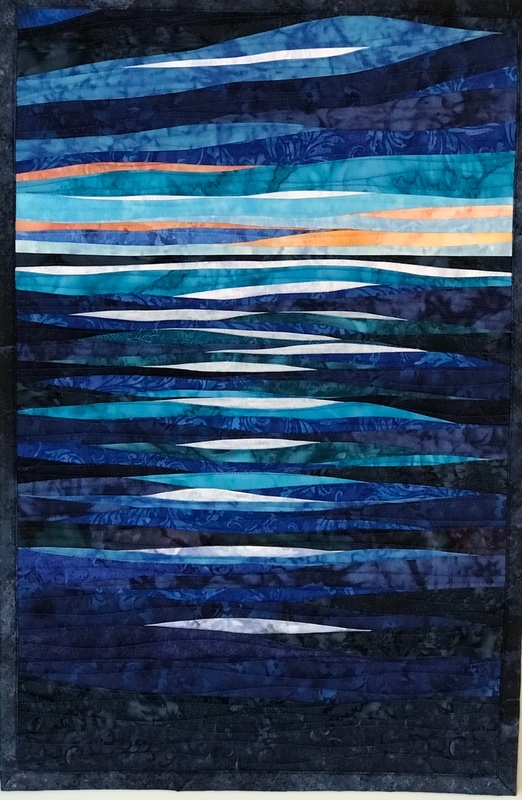 I decided it was time to give it a try so I created my first “Moon Shadows over Water” quilt. This is a medium size quilt at 17″W x 25″H. I knew I would be using many narrow and small strips to create the shimmer of the moon on the water. In the 25″ of the height of this quilt, there are about 75 different narrow pieces! I experimented with different light/white/cream fabrics for the moon reflections until I came upon the fabrics of choice which have a slight grey blue tint to them. The white/cream fabrics did too much “screaming” at you so they were ripped out and I tried again. Don’t think these efforts at art quilts are without ripping! I do my share of ripping and retrying. I’m looking forward to some slower months ahead for some more creative exploration. 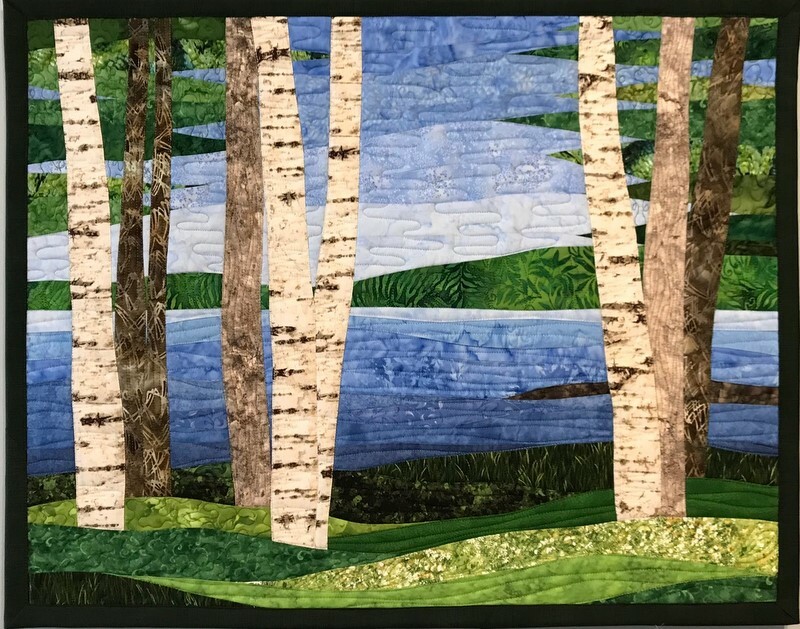 Hi Sharon, Last night I purchased the birch trees quilt. It’s my 3rd quilt I’ve purchased from you. I love it online and can’t wait to see it in real life. What drew me to the piece was the interplay between the lake and sky. This evening I came to your website to look at the quilt, and clicked on your blog to find your creative description. What a treat to read how you created the design. Its very clear you were studying the blues in the lake and sky. Some day I will come to one of your shows! Please post info on any upcoming shows you will be at! Maybe the Crozet show in VA? thank you! I am just learning how to find comments on my blog so I apologize for how late this response is. So glad you like your quilt! I’m trying to give more background on new quilts so I’m happy to hear you like reading those blogs. 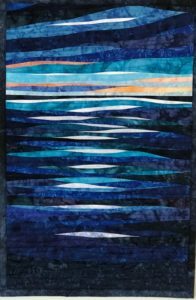 Your next quilt purchases will be 10% off and free shipping as a repeat customer. Thanks so much!